The other coat of arms, and this one really is a coat of arms, that we ran across in our recent trip to Las Vegas was actually found in the "fun" Las Vegas. 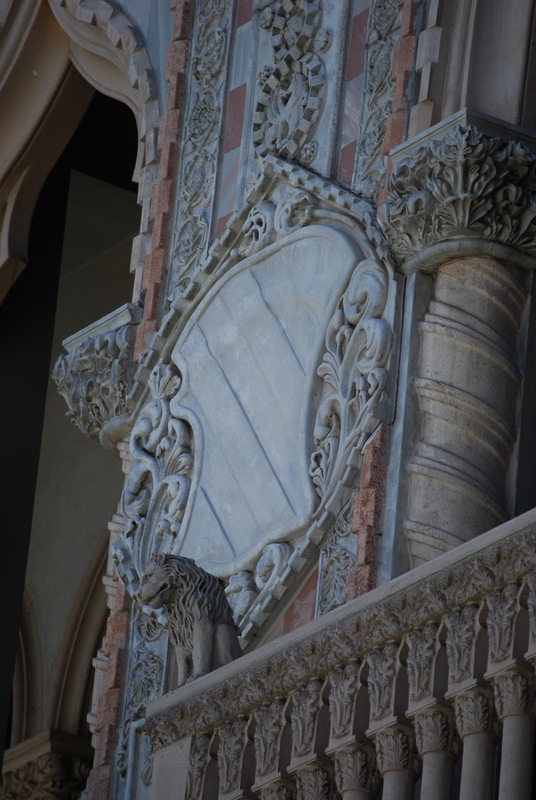 It was a coat carved into the facade of The Venetian hotel and casino in the heart of "The Strip" (that portion of Las Vegas Boulevard south of Sahara Avenue, where most of the really big hotel-casinos are located). Since there is no hatching on the carving, it's difficult to know who's arms these are. For a shield that is bendy, there are, for example, some 35 possibilities in Popoff's Répertoire d'héraldique italienne I, Florence 1302-1700 alone. Identification would depend entirely upon what the tinctures are. And, of course, the arms here are presumably Venetian, not Florentine.